A day off from the long hours at the hawkwatch and what do I decide to do, get up and go birding of course! I hadn’t quite gambled on the start time that my trusty guide for my days off Jonathan Meyrav had planned though. Still the thoughts of getting some nice specialist desert birds was temptation enough and nothing a couple of cups of coffee couldn’t fix. Have I mentioned how nice it is to be able to get really good coffee at gas stations as opposed to the general swill dishwater coffee you get in the US? Not to rag on my adopted homeland, but come on! It’s been a real treat to get to bird with Jonathan. He’s a great guide and his knowledge on everything birds, but also history and culture has meant even sharing early morning car rides has been a real treat. That morning it almost felt like I could have been back in Los Angeles as many a morning I have spent riding out to Lancaster, CA to look for migrant birds transitioning from Mediterranean to Desert habitats. The destination is rarely an abandoned Turkish Railway line though! There is something kind of magical about the pre-dawn hour in deserts, the cool air and the beautiful light! One of the main targets of the day was MacQueen’s Bustard an amazingly characterful turkey like bird, that though large can be difficult to find if you don’t know the right place. Of course Jonathan knows the right place, and within five minutes of scanning we had found two of these incredible birds. I am happy to note I spotted the first bird – still useful in some ways. Around us Desert Larks and Scrub Warblers frolicked but these lifers were little distraction from the magnificent Bustards in hand, or rather in scope. After enjoying the birds for a while we were on to the next stop of our packed itinerary, the waste water treatment plant (don’t birders go to the most delectable of places?) at Nitzana or Nizzana or however you want to spell it – there seem to be a slew of semiofficial ones. Anyway, like Lancaster, CA if you stick some water, a few trees and some shrubs in the desert it tends to draw both migrant and thirsty birds like a magnet. 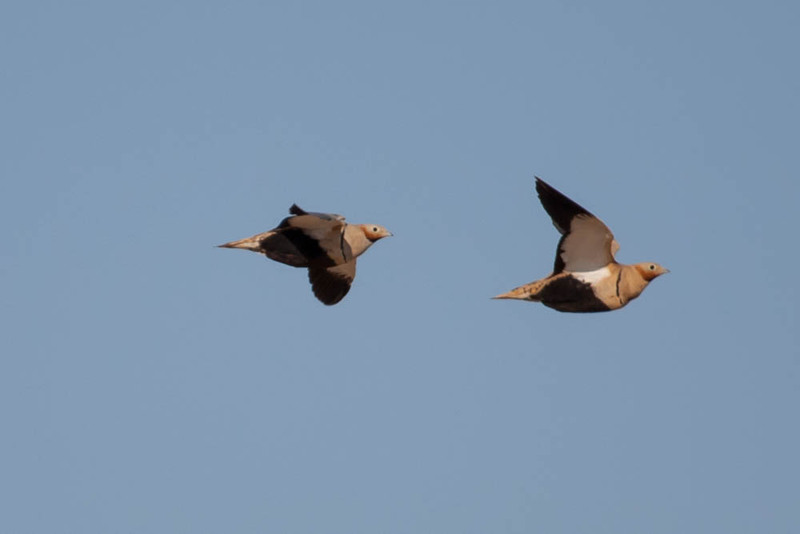 Here we were hoping for a family of birds I had been infatuated with since seeing them at watering holes in BBC documentaries as a kid: sandgrouse. Of course there was much else to occupy us including swarms of swallows and the usual array of common migrants as we waited: I now feel like I may have seen every Willow Warbler on the planet personally. Jonathan had said we needed to get there by 8:00am, but that time came and went and I tried hard not to look nervous or disappointed – maybe Jonathan was inscrutably doing the same. 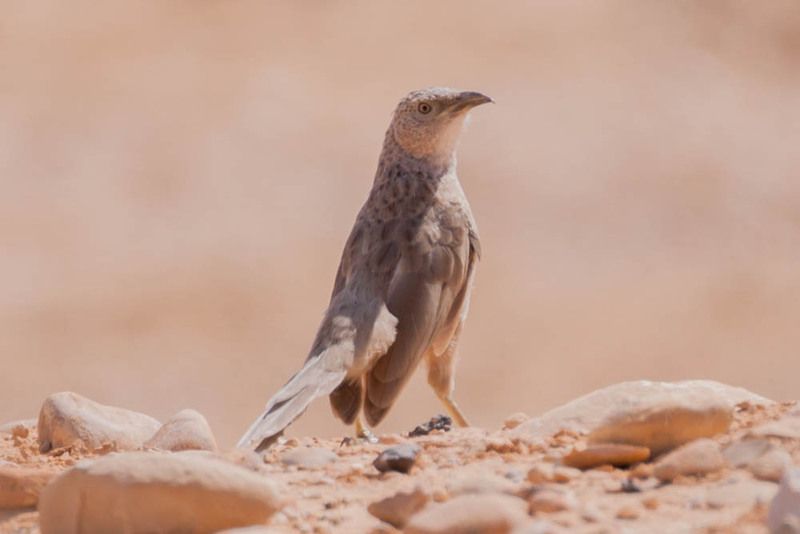 Then it started to happen, out in the desert came the calls of Black-bellied Sandgrouse (you can listen to them on Xeno-canto) – invisible in the deep blue sky before finally Jonathan spotted a flock as they came wheeling in out of the desert. We were positioned some distance from the main pool in order to make sure we didn’t disturb their important daily routine, which is as it should be. As they appeared though a few were kind enough to pass close enough to photograph in flight – stunning! A short wait and four less expected Pin-tailed Sandgrouse also put in a nice showing. Then nothing. We were waiting for one more species: Spotted. For a while not a peep and then some elusive and tantalizing calls from the desert emitted by our quarry (listen here). Were they nervous or were they just not thirsty? Those few minutes felt like hours before finally Spotted Sandgrouse appeared as if by magic out of the ether. My sandgrouse life list had shot from 0-3 in about half an hour. An incredible, beautiful and little understood grouping of birds that totally made my morning. After leaving the sandgrouse to do their thing we decided to quickly bash the other ponds for migrants to see what we could turn up. After ticking my first Bluethroat for the trip we spotted a little warbler skulking about in the reed beds. It looked like a Sedge (and was) but there was something about it that looked a little off. Of course as with many of these warblers we were struggling through partial and poor views of the bird. Still it might have given us just about enough pause for Jonathan to spot something else scuttle down the side of the bank out of the corner of his eye. His next words “Painted Snipe” almost didn’t register with me, as it wasn’t even a species I had considered studying up on for the trip and it took a few seconds for my brain to process what he’d said. From there we both dived for our cameras and started trying to at least record the bird, which by now had crept under some debris at the side of the pond and seemingly disappeared. I basically now aimed my camera at where I thought the bird was and fired away. 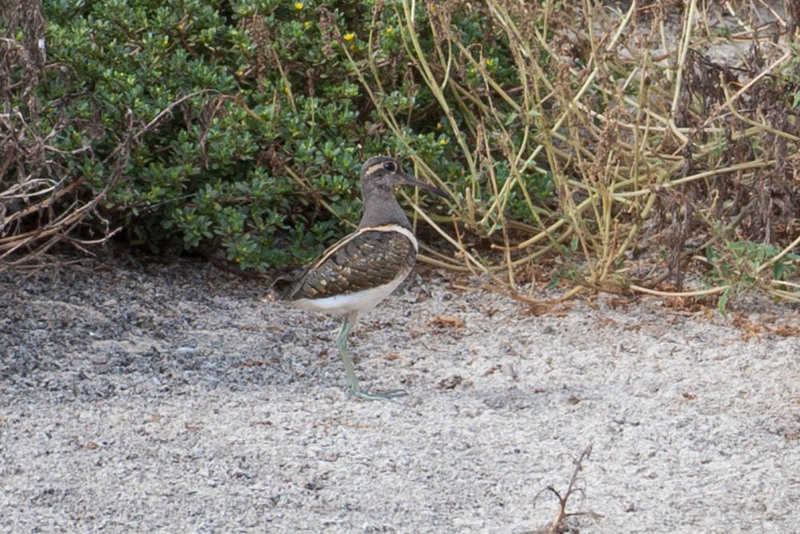 Here we were just stumbling across a bone fide Israeli Mega and a pretty good Western Palearctic Bird: Greater Painted-snipe (read more about this species here). We crept up a little closer and got a few shots before the bird weakly flew (as accurately described in the Collins Field Guide) off into a dry treatment bed and then ran for cover. Next job was to get on the phone and get there word out. There was a mixture of congratulations, jealousy, unsavory words in Hebrew and requests for directions and hopes that it stuck. Though we didn’t turn up much at the other migrant trap we pitched up at I was already more than very happy with what had been a memorable day out. If you want to follow Jonathan’s adventures on Facebook you can find him here (link). 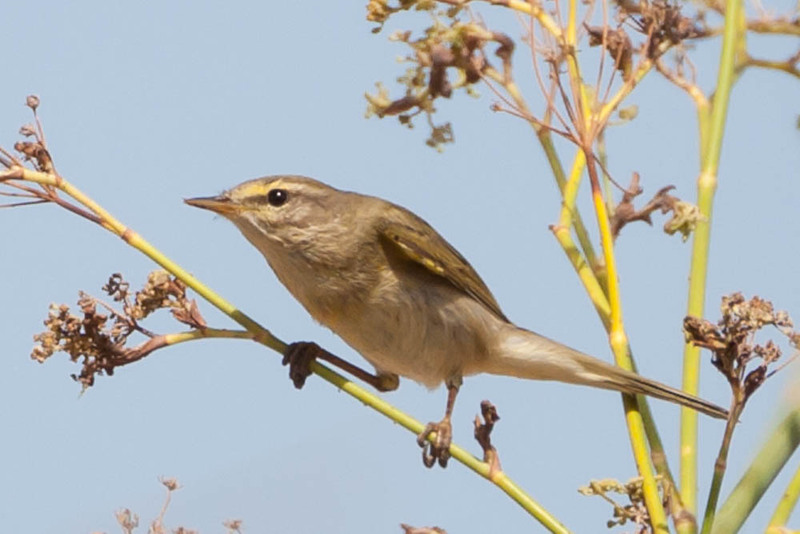 If you find yourself in Israel looking for birds I couldn’t recommend him more if I tried. Here’s our eBird list from the water treatment plant just to give you a flavor of what else we ran into (link here). Also a little nod to my relatively inexpensive Tamron 70-300mm lens. I think it’s doing a rather nice job of recording the trip thus far – not bad for $350!